This article is considered accurate for the current version (1.28) of the game. The regional divisions of the Indian super-region. India super-region in 1444 is fractured into many small - often one-province minor - states and several bigger states. Many of these nations share the same national ideas, culture and visuals. Many nations in the center and northern parts have Sunni or Shia set as their state religions, ensuring conversion of parts of the super-region to Muslim religions and an ongoing religious turmoil. The area often becomes a battleground for the Mughals empire in the mid-game and European powers towards the late game. The formation of Bharat and Hindustan also plays an interesting part in the super-region where each culture group can form either one but requires ownership of different set of provinces (scattered all over the super-region) for doing so. Several Monarchy forms (Indian Sultanate for Muslim states, Nayankara System for southern Hindu states, Rajput Kingdom for northwestern Hindu states and various others inbetween). Tribal governments are often used by smaller (OPM) nations, especially in the east-central and far eastern regions. Hindu serves as the de facto religion in the provinces of the super-region. Sunni Islam is set as the state religion of many nations in the northern parts. Shia Islam enjoys more popularity in the central regions. Small pockets of Vajrayana and Theravada Buddhism appear in the far north and south of the subcontinent, respectively. Animism is practiced in the far eastern edge of the super-region. All nations in the super-region belong to the Indian technology group. Hindustani and Eastern Aryan in the northwestern and northeastern respectively. Western Aryan and Central Indian in the western and eastern center parts respectively. Dravidian in the southern part. Some of these nations don't exist at the 1444 campaign start. They can appear if another nation chooses to form them. These nations don't exist and also lack cores at the 1444 campaign start. They can still appear if Separatist rebels manage to take control of their cultural provinces. In (parentheses) are the dates they first appear in. Notes: These articles refer to the state of the world at the start of the grand-campaign (1444-11-11); meaning, if a nation is picked in other time points it may have different attributes. Table listings include:  1444 starting nations,  1444 releasable nations. Other tags,  later start/pure formables/revolters ("wild card" stats), are mentioned at the top. Worth noting,  a nation is assigned a home region based on its capital's location,  location names use the default localisation for consistency reasons (for searching in-game enter the provided province numbers). For a list of all available tags check the Countries article. For Bengali countries, as well as Koch and Kachar. For Jharkhandi and Garjati countries. Notes: The province of Patna (558) is of religious importance for Buddhist nations. For Muslim countries in the Dravidian culture group and Marathi countries. For Hindu countries in the Dravidian culture group. Notes: Notes: This region holds provinces necessary to form Deccan. The province of Kandy (2099) is of religious importance for Theravada nations. Notes: This region holds provinces necessary to form Deccan. Releasable by Bahmanis and Chanda. Releasable by Bahmanis and Telingana. Generic Ideas for all countries that don't have one of the other groups. For Muslim countries in the Hindustani, Eastern Aryan and Western Aryan culture groups. For Pahari and Nepali countries. For non-Muslim Rajput and Malvi countries. For Bundelkhand, Bagelkhand, Kalinjar, and Gwalior. Notes: This region holds provinces necessary for forming Mughals, Nepal and Rajputana. The provinces of Doaba (2075), and Varanasi (2095) are of religious importance for Sikh and Hindu nations respectively. For Gujarati and Saurashtri countries, as well as Baglana. 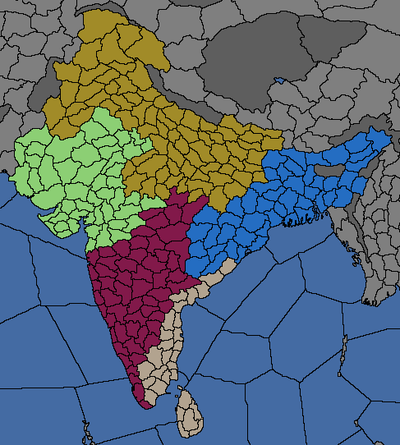 Notes: This region holds provinces necessary to form Rajputana. This page was last edited on 13 December 2018, at 11:37.